"Great tasting German-style roasted nuts you get at fairs and festivals!" Preheat oven to 325 degrees F (165 degrees C). Line a baking sheet with aluminum foil. Combine honey, butter, and 1/2 teaspoon cinnamon in a small saucepan; bring to boil. Cook and stir until butter is melted, about 2 minutes. 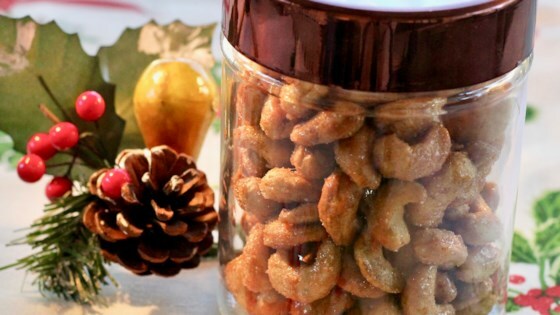 Place cashews in a large bowl; pour honey mixture over cashews. Stir to thoroughly coat. Spread coated cashews on the prepared baking sheet. Bake in the preheated oven until cashews are glazed and very lightly browned, 10 to 15 minutes. Cool cashews for about 20 minutes; transfer to a bowl. Mix sugar and 1/2 teaspoon cinnamon in a bowl; sprinkle over cashews. Stir to coat evenly. SO GOOD! Made them twice in a week period!